Update as of March 23, 2010: Congratulations to Emma and Dan! State championships were held at Bucknell University this past weekend. Emma placed twenty-ninth in the 100 Yard Freestyle and Dan placed 18th in the 500 Yard Freestyle and 19th in the 200 Yard Individual Medley. The Rebels swim team and everyone at Seton-La Salle is so very proud of you two. Congratulations to all the Rebel swimmers who participated in the WPIAL Swimming Championships on March 4th and 5th. Everyone swam incredibly well and did even better than expected. In particular, the Girls 400 Yard Freestyle Relay dropped twelve seconds off their fastest time, and the Boys 400 Yard Freestyle Relay dropped fourteen. 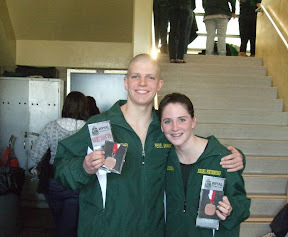 A special congratulations goes out to senior Emma Simmers and junior Dan Mazur, both of whom medaled and will be swimming in the state championships at Bucknell University this week. Emma received a sixth place medal for her time in the 100 Yard Freestyle and Dan took fourth place in the 500 Yard Freestyle.